This article has been prepared by Terry Marsh of the Centre for Ecology and Hydrology and Melinda Lewis of the British Geological Survey. Much of the information is derived from the National Hydrological Monitoring Programme, which is a joint CEH/BGS venture. Find out about our upcoming conference and workshop on drought. Droughts are naturally occurring features of the UK climate and are multifaceted both in their characteristics and range of impacts. Consequently, indexing drought severity is complex. A period of notably low rainfall is a feature of all hydrological droughts, but each drought event has a unique combination of duration, spatial extent and intensity. Nonetheless, a distinction may be drawn between meteorological droughts (defined essentially on the basis of rainfall deficiency), hydrological droughts (where accumulated shortfalls of runoff or aquifer recharge are of primary importance) and agricultural droughts (where the availability of soil water during the growing season is the critical factor). Additionally in a water supply context, hot weather can affect water demand (e.g. for the irrigation of both crops and gardens); this can overstretch local water distribution systems creating calls for the moderation of water use at times when overall water resources may be healthy. The perception of drought intensity will therefore not necessarily align with either a particular hydrometeorological index or any measure of water resources. The UK is remarkably diverse in terms of its climate, topography, land use and patterns of water exploitation; each of these factors is of relevance to drought vulnerability. There is a clear regional contrast in vulnerability to drought. Sustained drought conditions in the Scottish Highlands, where average rainfall can reach 5000 mm, are rare. By contrast in the English Lowlands, annual rainfall totals may be an order of magnitude lower and the concentration of population, commerce and intensive agriculture make for the highest water demands. Therefore in these areas there is greater vulnerability to drought. However, importantly the major aquifers (pdf 590Kb) have a substantial moderating influence. Groundwater is the principal source of water supply in much of the English Lowlands and overall groundwater storage far exceeds the volume stored in all the reservoirs together. Almost all droughts have surface water and groundwater components, but their relative importance, particularly in relation to impacts, can vary greatly. The groundwater resources of an aquifer, upon which the long-term yield of boreholes depend, are replenished naturally by rainfall. Normally recharge takes place during the winter months when potential evapotranspiration is low and soil moisture deficits are negligible. Accordingly groundwater levels vary seasonally, with levels generally rising from autumn through winter into spring. During the summer months, potential evapotranspiration generally exceeds rainfall, soil moisture deficits build up, and little, if any, infiltration takes place in the lowland areas of the UK. 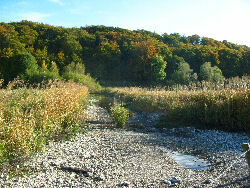 Groundwater is a major component of river flows, maintaining sufficient flow for surface water abstractions to continue. Hence groundwater levels fall as aquifer storage is depleted by flows to rivers and springs, as well as by abstraction from boreholes. This pattern is not, however, constant, since rainfall varies both over time and areally. Infiltration and hence variations in water levels are also affected by the properties of the deposits through which it passes to reach the saturated zone of an aquifer. The fluctuation in water levels within an aquifer is also affected by the storage coefficient; where this is small, a given volume of water will result in a greater rise in water levels. Therefore in aquifers with low storage coefficients such as the Chalk, rivers in hydraulic continuity with, and fed by, groundwater can have intermittent sections. These streams, often referred to as ‘bournes’ (Figure 1), are a natural characteristic of Chalk downlands with the positions of the ephemeral and perennial heads often being significantly different as well as their respective positions also varying each spring and autumn, depending on the antecedent conditions. Therefore as groundwater resources are replenished each winter, groundwater droughts are characterised by one or more dry winters, when the effective rainfall available for recharge is low. Throughout history, drought conditions have had a substantial impact on both communities and the environment. In Medieval times, a lack of spring and summer rainfall could threaten the lives and livelihoods of a significant proportion of the population, through the failure of local water sources and inadequate harvests. The drying-up of wells and springs continued to have a severe impact throughout the19th century when the frequency of winters with below average rainfall was greater than it is today. Figure 2 indicates two-year periods when the largest winter/spring rainfall deficiencies occurred. This indicates that although recent droughts have been caused by similar winter rainfall deficits to those 100 years ago, they have been of generally shorter duration, with few extending over more than two winter periods. In the 150 years before the First World War however, winters were generally drier and clusters of dry winters were appreciably more common. Correspondingly, groundwater levels remained seasonally depressed for very extended periods (Figure 3), posing a continuing threat to local water supplies. The most outstanding of these sustained droughts was the ‘Long Drought’ that lasted from 1890-1910. This was, however, punctuated by several notably wet interludes; 1903 is the wettest year on record at Kew (in a series from 1697) but the record summer rainfall, and associated flooding, was accompanied by acute water supply problems due to the failure of wells and springs. The ‘Long Drought’ has no modern parallel and any repetition of the extended sequence of dry winters would represent a considerable water resources challenge given modern water demand patterns. More recently notable droughts also occurred in 1932-34 and the 1940s, but in modern times, the most extreme drought conditions were experienced in 1975/76. Rainfall over the May 1975-August 1976 period was the lowest on record for England & Wales in a series from 1766. The exceptional dry winter resulted in notably low groundwater levels and the impact on river flows was even more dramatic. Many rivers and streams dried up and most of the minimum flows recorded in the summer and early autumn of 1976 have not been eclipsed since. The drought achieved an extreme expression in parts of eastern and southern England. In the River Thames, the combined effect of drought conditions and continuing abstractions to meet London’s water needs, resulted in a cessation of flow at Teddington Weir (the tidal limit) during the late summer; thought to be the first time this had occurred in recorded history. Many other rivers and streams were dry in late summer 1976. Only the exceptionally wet autumn of 1976 prevented the imposition of severe water use restrictions across much of the Thames basin. 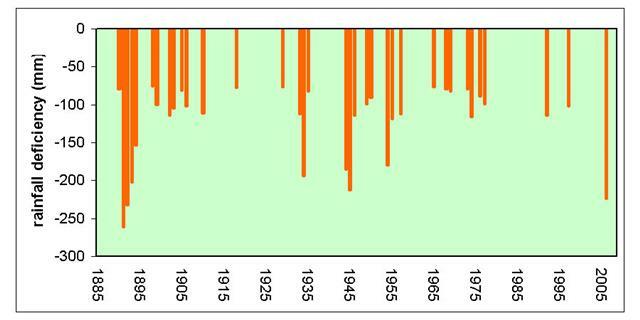 In the late twentieth century low winter rainfall contributed to two extended drought episodes, 1988-1992 and 1995-97; their impact on groundwater was particularly severe with a few boreholes in the Chalk reporting their lowest groundwater levels for almost 100 years during the former event. The depressed groundwater levels were accompanied by a substantial contraction in the river network as springs failed and groundwater-fed streams dried up. In the recent past, England & Wales was again subjected to extended drought conditions in 2004-06. A cluster of droughts during the last 15 years has focussed public and political attention on the likely impact of climate change on drought risk in England & Wales. The impact of both climate variability and climate change on drought risk is complex and may be subject to significant spatial differences, spatial contrasts in water demand and the permeability of individual catchments being especially important. In a warming world, evaporation demands are likely to rise further, and most favoured climate change scenarios envisage a continuing decline in summer rainfall in south-east England. Both factors are likely to exacerbate drought risk particularly in an agricultural context. On the other hand, an increase in winter rainfall is anticipated; this would be beneficial from a water resources perspective, allowing reservoirs to fill more readily, increasing seasonal groundwater recharge and facilitating greater river abstraction rates to augment stocks in pumped storage reservoirs (e,g, those servicing London’s water needs). Historical data confirm that the portioning of annual rainfall between winter (November to April) and summer (May to October) half years has undergone major changes since the later eighteenth century. Over this period average temperatures have increased by around 1.5 ºC with a particularly steep increase over the last 30 years. In considering how the balance between these climatic tendencies may affect drought risk in the Thames basin, it is instructive to compare the droughts of 2003 and 2004-06. The 2003 drought was an intense spring/summer event during which exceptionally high temperatures caused very considerable heat stress. Rainfall over the Thames catchment for the February to October period was only around 60% of average; the 2nd lowest in the 127-year catchment rainfall series. Flows in many rivers draining largely impermeable catchments were relatively depressed by the autumn of 2003, but water resources held up well and no restrictions on water use were needed in the Thames basin. Primarily this was because the preceding winter (2002/03) was notably wet and both surface and groundwater resources in the early spring were well placed to resist the exceptional 9-month rainfall deficiency. By contrast, the 2004-06 drought resulted from three successive dry winters, interspersed with above average rainfall in the summer half years. As a result, groundwater levels became very depressed over wide areas and drought conditions were both severe and protracted. Despite seasonally normal rainfall over the period April to September 2006, restrictions on water use, primarily hosepipe bans, extended to over 12 million consumers. As significantly, the stream network contracted markedly with an associated loss, albeit temporary, of aquatic habitat particularly in the upper reaches of groundwater-fed streams and rivers. Thus, whilst increasing water demand and higher evaporation rates may exacerbate future drought risk, the rainfall patterns currently envisaged by most climate change scenarios (wetter winters and drier summers) could help increase the resilience of much of England & Wales to drought episodes. In Scotland where supplies are often derived from small, localised aquifers (superficial deposits or fractured bedrock) springs may fail more frequently if summers become appreciably drier. However with projected climate change impacts on rainfall, evaporation and aquifer recharge patterns across the UK, groundwater will continue to be of vital importance for water supply purposes and the major contribution it makes to the health of the aquatic environment. Marsh T, Booker D and Fry M, 2007, The 2004-06 Drought, an occasional report in the Hydrological data UK series, Centre for Ecology and Hydrology, Wallingford. Marsh T, Cole G and Wilby R, 2007, Major droughts in England and Wales, 1800-2006, Weather, 62 (4), 87-93. Marsh, T J, 2004, The UK drought of 2003: a hydrological review, Weather 59 (8), 224-230. Manley G, 1974, Central England temperatures: monthly means 1659 to 1973. Quart. J. Roy. Meteorol. Soc., 100, 389-405.